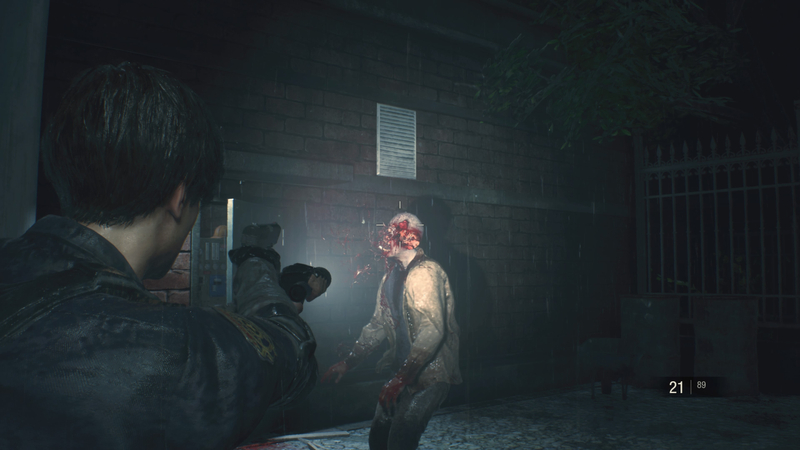 I’m not going to beat about the bush on this one: Resident Evil 2 is a triumph. Whether you are a fan of the original or not, this remake is phenomenal. Right from the beginning, it sinks its teeth into you like the zombies contained within, and it refuses to let go. 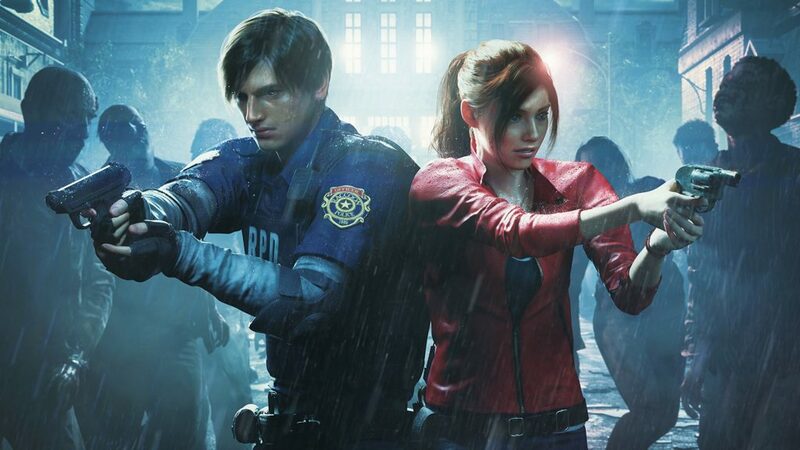 You play as either Leon Kennedy (thankfully, he’s dropped the middle “S” initial when he introduces himself) or Claire Redfield, who are both drawn to Raccoon City on the same day. Claire is looking for her brother, Chris, while Leon is heading to his first day as a police officer in the RPD, and quite possibly the worst first day ever. You see, Raccoon City is in a bit of a pickle on the day that our heroes arrive. A virus has ravaged the population and turned them into the walking dead, leading Claire and Leon to head to the police station in an attempt to find safety. Probably not their best decision, as it turns out. The great thing about the original game is that it was still a fantastic entry point to the series, requiring no prior knowledge of the story. This means that newcomers to Resident Evil will be right at home in the remake too, and as with the Gamecube remake of the first game, Capcom’s complete reimagining of its classic sequel means that this is essentially a brand new experience for both new players and fans of the PlayStation original. Make no mistake, fans will not be disappointed. The game may have been rebuilt from the ground up, but there is still a familiarity in its design that had me grinning on numerous occasions throughout. 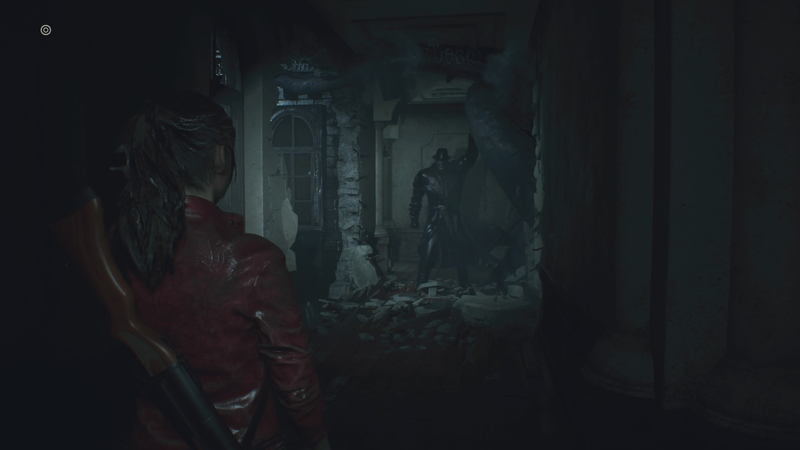 From direct reproductions of certain rooms and corridors, to the little musical nods littered throughout the game, it feels like Resident Evil 2. The game sets its stall out early on, as you’re forced into a dark corridor with nothing but a torch and your near-empty handgun. The darkness feels like it’s pulling you in, your torch illuminating nothing but ruin and decay, as you search for survivors and clues as to what happened in Raccoon City. Fairly soon, you’ll find yourself surrounded by the undead and struggling to survive, which is a feeling you’d better get used to. They shuffle and lurch toward you, their flesh rotting and their teeth gnashing, and they don’t drop easily. Headshots do the most damage, but shoot their arms and legs and the sinews start to stretch, as limbs tear free from their owners. It’s disgustingly impressive and, as I said, these zombies don’t drop easily. But it’s not just the undead you have to worry about in Resident Evil 2. I’m not just talking about the Lickers, terrifying in their shiny new RE Engine incarnation; there is another danger that stalks the hallways of the RPD building: the Tyrant. Originally, this trenchcoat-wearing hulk would not appear until the second scenario that took place alongside the main story. He was seemingly unstoppable in his pursuit of Leon or Claire, but would only show up at set times. However, in this new version, not only does he stalk you during the main story, he sticks around. I swear, whenever I hear the clomping of boots from now on, it will trigger horrific memories of hiding from the Tyrant. I literally said, “nope,” when he first appeared, as I turned on my heel and fled in fear. The Tyrant is actually a fantastic example of how well sound is used in Resident Evil 2. When played with headphones (or a big ol’ surround sound system), you’ll hear his heavy boots stomping around whenever he’s nearby. Music rarely plays, leaving the ambient sound to do most of the heavy lifting, which makes his proximity all the more alarming. There was a moment during my Leon playthrough where I was in a small room with only one way in or out, when I heard those boots stomping around and I froze. I backed Leon into the corner, hoping that the Tyrant would give up and try elsewhere, the muffled boot steps not allowing me to get a precise fix on his location. Then the door burst open and I found those lifeless eyes locked on me, the music kicked in and all hell broke loose. Instinct drove me to pull my shotgun’s trigger, the impact hitting the Tyrant square in the face and staggering him just enough that I could make my escape. He followed and I fled in terror, I dodging zombies, only for him to toss them aside like ragdolls. This sums up most of my time in the Raccoon City police station. However, it must be said that after a while the Tyrant’s pursuit can become tiring. You might find yourself having to do a lap around the station to avoid him when he just happens to be wandering around outside the room you need to enter. Don’t get me wrong, it’s never less than incredibly tense even then, but there will probably be times when you just want to go use that key you just found. It is possible to lose him for a while, but when things go silent that can be even worse, as he can pop up when you least expect it. Capcom has nailed the atmosphere, with some astonishing visuals to match the quality of its sound design. Even the opening shot of the game, a close-up of a greasy burger followed by the truck driver’s messy eating of said burger, just feels like the developer is showing off. There is a level of detail in this enhanced version of the RE Engine, the same one used for Resident Evil 7, that shines whether you play in 1080p or 4K resolution. I did try it in both, but it’s an impressive feat that the PS4 Pro has it running at 60fps in 4K with nary a dropped frame. The level of detail in the characters is in a different league to RE7, which is impressive in itself, and Leon, Claire and Ada look especially real at times. Every time there’s a close-up shot of either main character, the animation is jaw-dropping. The gameplay is where it really shines, though. Gone are the fixed camera angles, instead replaced with the claustrophobic over-the-shoulder view of Resident Evils 4-6, which allows you to really get close to the horror. I spent most of my first playthrough carefully walking around (when I wasn’t being chased), checking corners and shining my torch into every nook and cranny, pausing at every zombie groan heard in the distance. I had to watch my ammo, choosing whether to take out a zombie or bypass them entirely. 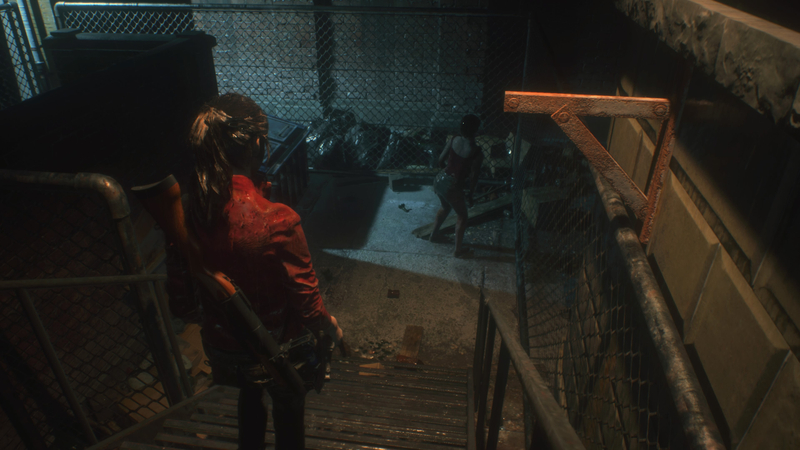 Inventory management is key in Resident Evil 2, as you strike that balance between carrying the right ammo and health items, while leaving yourself room to pick up new items and keys. When things get more heated, like when a boss is trying to put its giant claws through your face, the controls still feel tight and responsive. The only reason you’ll miss a shot is because you’re panicking at that rapidly approaching claw. But like the Resident Evils of old, this remake focuses as much on exploration as it does on its action and scares. You’ll spend a good few hours looking around the police station, backtracking when you find the key to that locked door you passed an hour ago, but the game never lets you do it in peace. Something is always waiting for you, or tracking you. Even if you think you cleared that corridor earlier, chances are something new has crawled out of the woodwork. At one point, I returned to an area to find that several new zombies had appeared because I hadn’t boarded up some windows. That caught me out completely. Puzzles make a welcome return on top of all this, in both familiar and new forms. Some are as straightforward as finding a key item, whereas others offer nothing but a riddle or an image, leaving you scratching your head for a while. It feels good when you find the answer and it all adds up to an experience as rewarding as it is terrifying. Resident Evil 2 is a remake that feels incredibly faithful to the original, paying homage through subtle music cues that recall classic pieces from the 1998 soundtrack, as well as telling the same story for a more modern audience. Not to sell it short however, as it’s far more than a simple remake: It constantly throws new things at you during the 12-15 hours of that first full playthrough. It feels like a whole new game that anyone can enjoy, as long as they don’t mind changing their underwear after each gameplay session. This is not just Resident Evil for a new generation. This is Resident Evil at its absolute best.